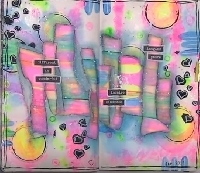 Ready for another art journal page? Let's follow the tutorial found HERE by Bella Rose Creative. Feel free to change up the colors/designs in order to use what you have on hand. Have fun creating the page in your own style!